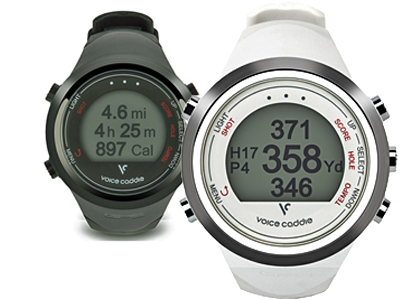 The use of GPS technology to determine distance to the green has been around for some time and now Voice Caddy, makers of the clip-on device that reports distances verbally, has introduced the T1 Hybrid Golf Watch. The T1 doesn’t report yardages by voice but does show front, back and middle of the green distance on a large, readable display. Having it strapped on for ten rounds it quickly became a part of my equipment to be referred to without a second thought. Once switched into golf mode there are no more buttons to push, in fact if using it just for the distance measurements, the next time you have push a button is when you finish the round to switch it back to being a watch. As with all the GPS devices I have tested, the first time out with the T1, I checked the readout against a laser range finder and it matched very well after taking the exact pin location into account. In other words if the T1 showed 148-yards to the center of the green and the laser showed 151, pacing from the center to the pin was within a yard or so of 151. This brings up an interesting point though. How accurate does a distance measurement have to be? Having played for a lot of years, most of them with a low single digit handicap, I still don’t think I have a swing that allows me to be confident of hitting the ball to a super precise distance—say within a yard or two. Or put another way, all things being equal, whether it’s 148 or 151 with a decent lie and no wind to factor in, I’m still hitting an 8-iron. Period. If you’re better than that good for you, I hope you make a lot of money on Tour. The T1 comes with some 30,000 courses preloaded with Voice Caddy providing updates at no cost. Plus there are some other useful features such as a scorecard and score history to track your game and a very handy swing tempo readout. The T1 even can tell you how fast you are walking, the distance traveled and calories burned. The price is $169 in either white or black and it is available at VoiceCaddy.com.